Throughout the years, businesses analysis have continuously improved to survive any possible barrier that could hinder them to achieving greater heights. Technical analysis is considered as one tool to help people in the business world to choose the best path. Every decision leads to more than one outcome, either good or bad. Making decisions can be challenging most specially for those large organizations. Rather than analysis in writing, you can use decision tree simple analysis to get a clearer picture of where your decisions may lead to. 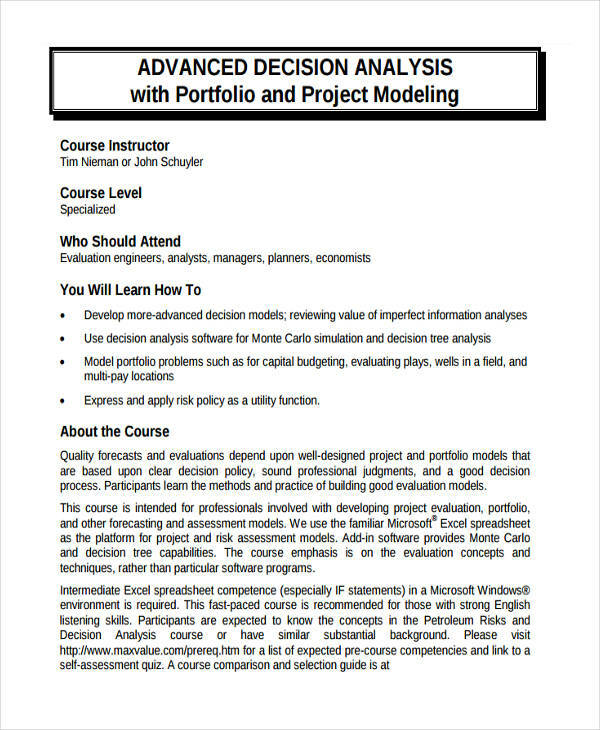 Decision Tree Analysis is usually structured like a flow chart wherein nodes represents an action and branches are possible outcomes or results of that one course of action. The results may be a positive or negative outcome. 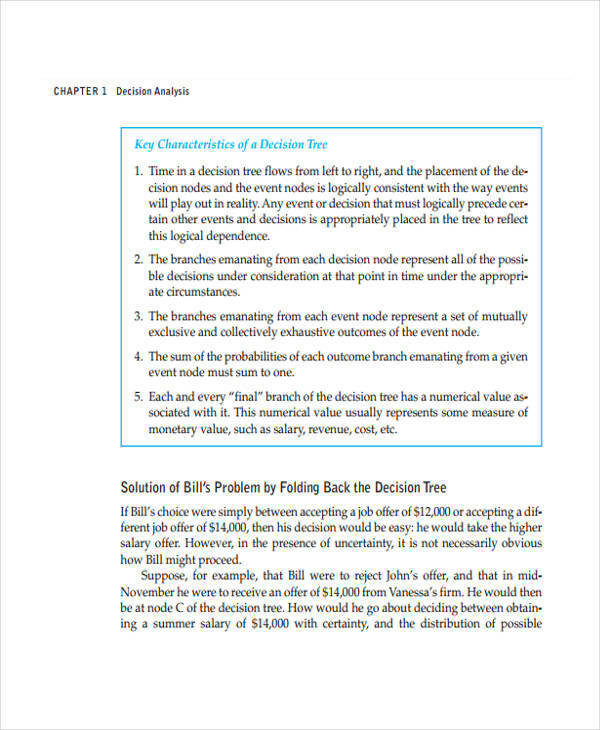 Decision tree analysis is different with the fault tree analysis, clearly because they both have different focal points. 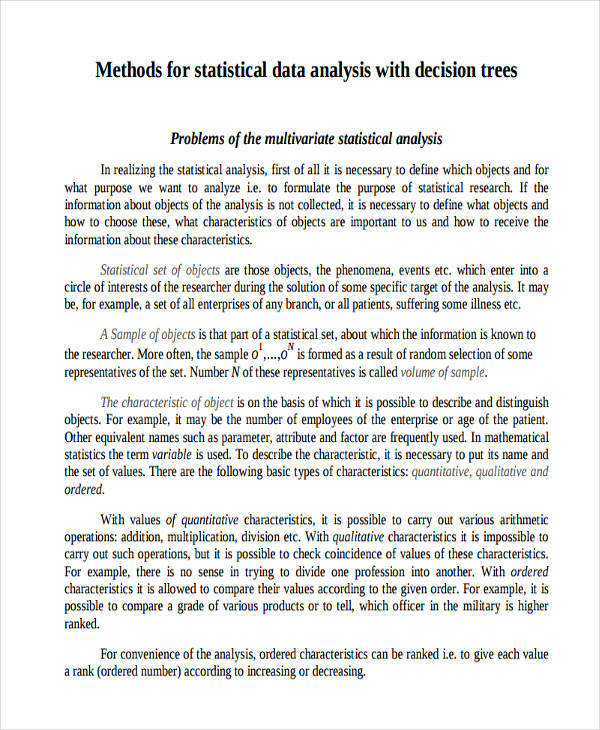 A decision tree analysis is often represented with shapes for easy identification of which class they belong to. 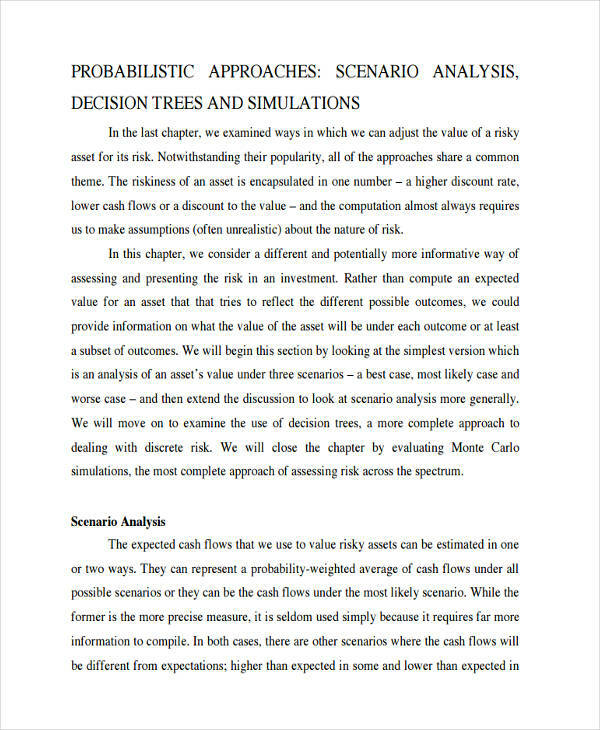 Although decision trees are most likely used for analyzing decisions, it can also be applied to risk analysis, cost analysis, probabilities, marketing strategies and other financial analysis. SIMPLICITY. 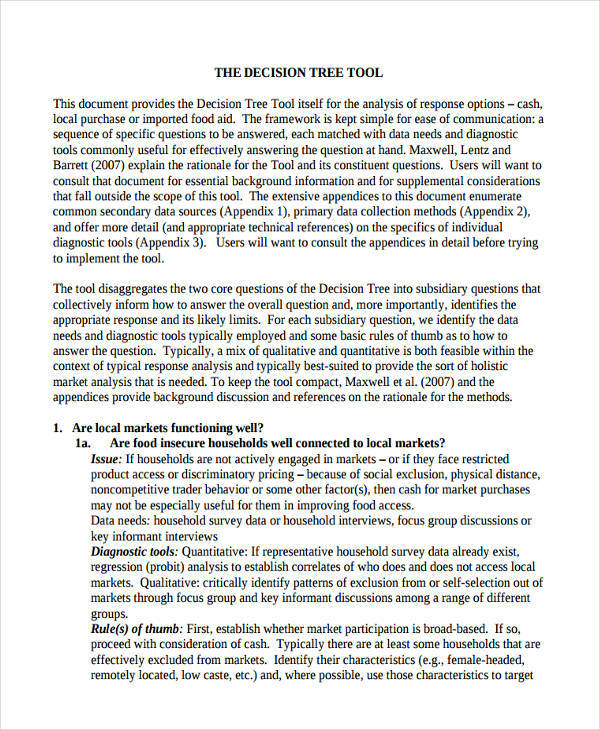 A decision tree analysis is easy to make and understand. Because of its simplicity, it is very useful during presentations or board meetings. WISE DECISION MAKING. 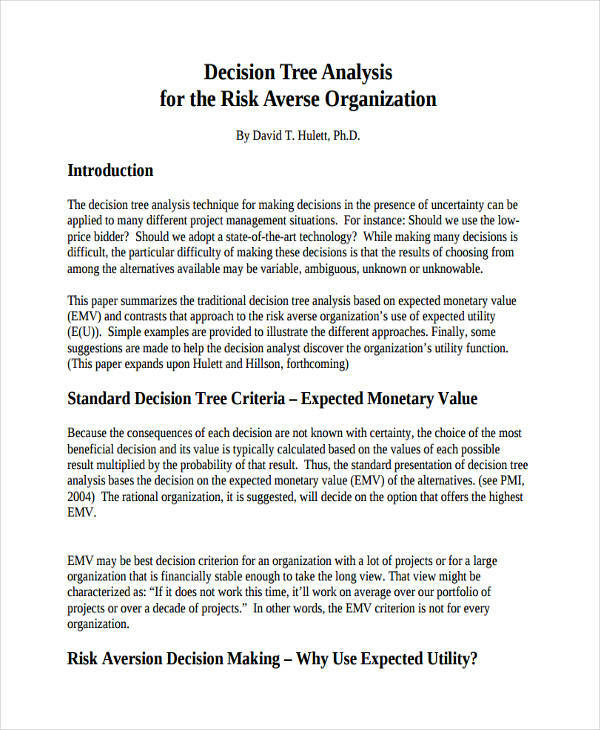 To make sure that your decision would be the best, using a decision tree analysis can help foresee the possible outcomes as well as the alternatives for that action. 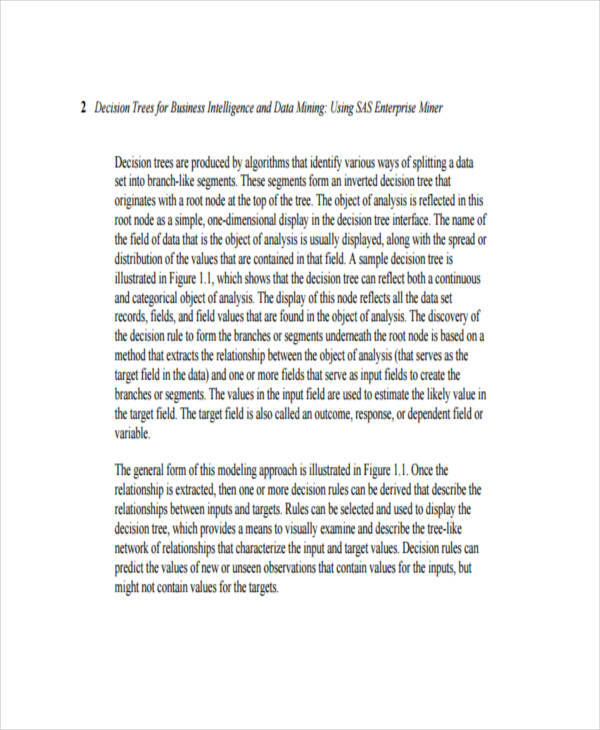 Just like analysis examples in Excel, you can see more samples of decision tree analysis below. IDENTIFY PROBLEMS. Start with identifying problems using structured terms. DESIGN THE MODEL. A decision tree should follow a schematic flow for the process to be smooth and organized. 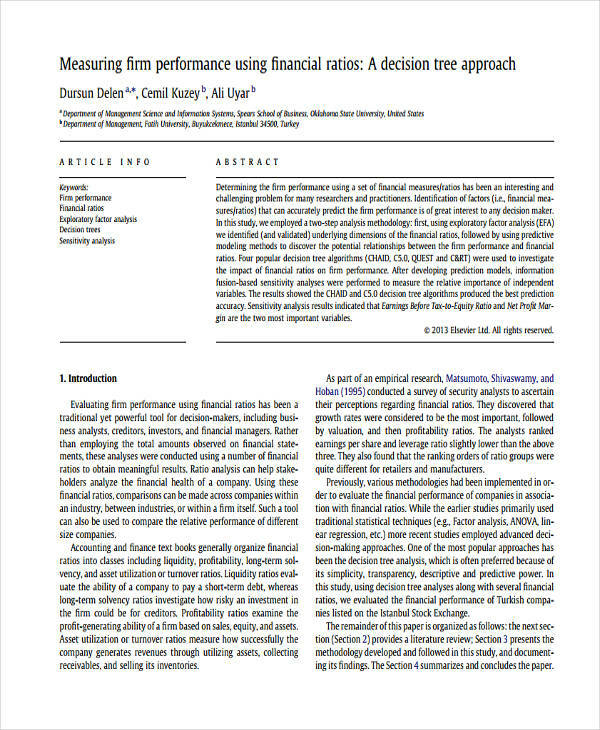 APPLY PROBABILITY VALUES AND FINANCIAL DATA. Distinguish which of the branches and sub-branches have values and apply them accordingly. SOLVE THE PROBLEM. Once all the problems and possible outcomes have been laid out, look for the best solution. PERFORM A TASK ANALYSIS. Observe and analyze each action and its result. TRANSPARENCY. With a decision tree analysis, you can easily see everything in a single view which allows all possibilities and alternatives to be visible. EASY TO USE. Every decision tree is designed as how you want to present it. It is easily illustrated in a graphical manner to simply show all the alternatives and outcomes. TIME-CONSUMING. 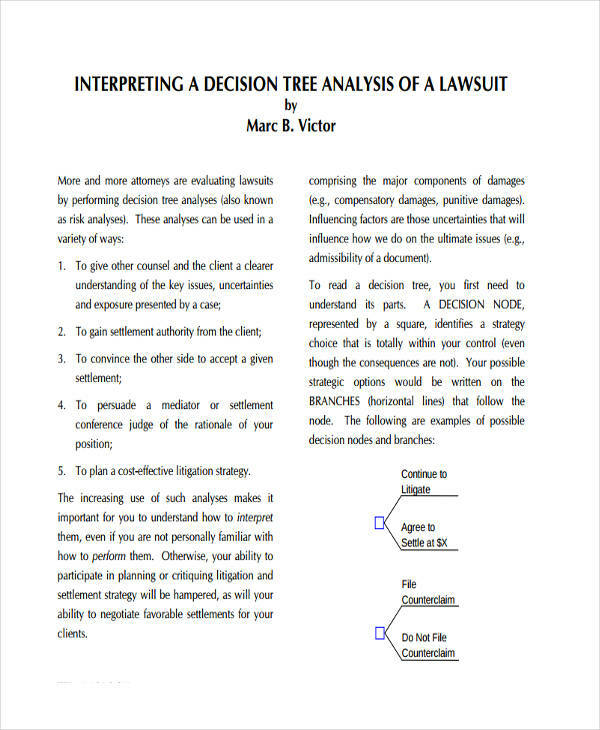 Unlike free analysis example, designing a decision tree takes more time for a large one with many branches. INSTABILITY. One change can affect the whole branch most often when problems occur at the very first step. LIMITATION. The analysis may be limited in probable values.